(Bloomberg) -- There is an informal Wall Street hierarchy in which equity investors are the undergrads of the investment world, bond traders the doctorates. Befuddled stock jocks lose track of the plot when talk turns to the obscure semiotics of the fixed-income world. Maybe that’s one way to explain a week when the biggest uproar in Treasuries since 2016 engendered nary a peep in riskier assets. Here’s another. Bruised and chastened after their own go-round with volatility, equity owners are too roughed up to care about your yield-curve panic. They’ve gotten comfortable with chaos, when only a few months ago it wasn’t low rates but high ones that launched everyone into a fit. Whatever confusing message rates may be flashing, it’s happening at a time when earnings are holding up, the economy is hobbling along and the biggest villain on the equities enemies list -- the Federal Reserve -- has been muzzled. Part of it is timing. People say bonds lead stocks, but it’s hard to argue the fixed-income freakout didn’t have at least some precedent in the 10,000-point roundtrip for the Dow Jones Industrial Average that began in October. Equity investors are feeling inured after an episode that now looks like jumping the gun, given the blistering recovery since Christmas. The result? 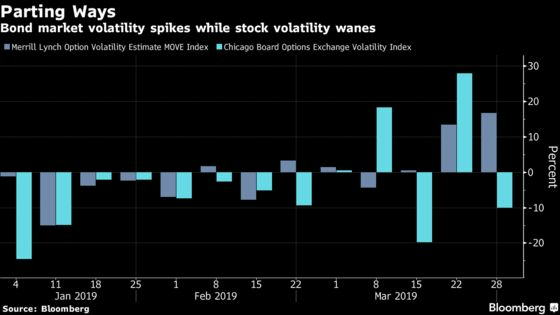 While gauges of interest rate volatility soared, the S&P 500 is headed for one of its smallest weekly moves of the year. The relative altitude of bond yields has rarely been a defining worry for equity holders throughout the longest bull market on record. More relevant has been the pace of earnings growth, which while weakening, is still expected to be 5 percent in 2019. The furious pace of earnings downgrades seen this year is also easing. Bank of America’s estimate revision ratio, which measures the number of analysts cutting forecasts versus raising them, advanced for the first time in six months in March. While there are still more analysts slashing their forecasts than lifting them, the ratio now sits at the highest level this year. Gross domestic product is rising precariously -- the fourth-quarter expansion was just downgraded to 2.2 percent from 2.6 percent -- but that roughly matches what has always prevailed during a 10-year rally in which the S&P 500 has quadrupled. 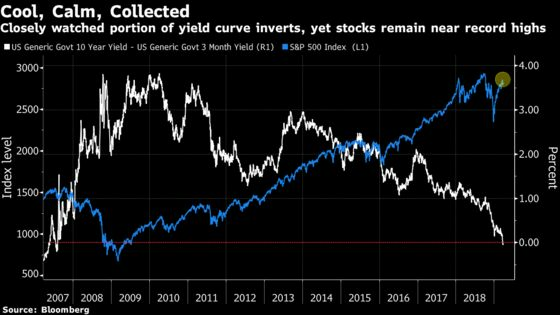 Even if one portion of the yield curve inverting is the sign of a looming recession, investors still have time, if history is any guide. Say the unthinkable happens and the two-year Treasury rate rises above the 10-year one. In the past times that’s happened since 1978, the S&P 500 kept on going up for 19 more months on average, clocking a 22 percent return, data compiled by LPL Research show. Stocks sure looked like something was bugging them in the fourth quarter, when $5 trillion was erased from U.S. share values. One was the impact on earnings from President Donald Trump’s trade war. A bigger concern appeared to be Powell’s Fed, which has since walked back plans to raise rates as many as two times in 2019.